Teenager Adam Peaty set a new British 100m breaststroke record in the opening session of the World Short Course Championships in Doha, Qatar. Peaty swam a time of 57.02 seconds in his heat – taking half a second off fellow Briton Michael Jamieson’s previous best time. The 19-year-old, who holds four European and two Commonwealth titles, swims again in Wednesday’s semi-final. He currently holds the 50m breaststroke long course world record. GB’s Hannah Miley competes in the final of the 400m individual medley later. 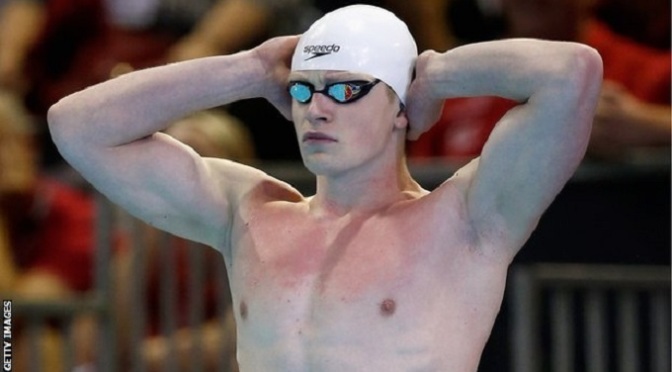 Peaty, who holds four European and two Commonwealth titles, currently holds the 50m breaststroke long course world record. He competes in the final on Thursday. South Africa’s Chad le Clos took the first medal of the championships in Wednesday’s men’s 200m freestyle final. Lithuania’s Plymouth-based Olympic champion Ruta Meilutyte then set a new championships record time of 28.81secs in the women’s 50m breaststroke. She will face Jamaica’s Alia Atkinson in Thursday’s final – but British hope Sophie Taylor failed to qualify. Also in Wednesday’s evening session, Miley races in a field including Hungary’s world record holder, Katinka Hosszu. There are also semi-final races for Great Britain’s Chris Walker-Hebborn (men’s 100m backstroke), Georgia Davies (women’s 100m backstroke) and Adam Barrett (men’s 100m butterfly). British Swimming has taken an 11-strong team to Qatar, boasting 11 Commonwealth and seven European titles between them – although Scottish Commonwealth gold medallist Ross Murdoch is missing because of a chest infection. Six-time world champion Mark Foster said the current GB swimming squad is the best he’s seen for 30 years. Men: Adam Barrett, James Guy, Adam Peaty, Ben Proud, Chris Walker-Hebborn. Women: Jazz Carlin, Georgia Davies, Fran Halsall, Hannah Miley, Siobhan Marie O’Connor, Sophie Taylor.